I experienced my pages slowing down when using Google Analytics togheter with my Firefox AddOn NoScript. Since I’m far from the only one using NoScript I found this not acceptable and worked out a possible work around. The reason for the slow down is likely the timeout of the connection between my domain (where I’ve allowed scripts to run) and Googles domains (where I might or might not have allowed scripts). The first part of the code creates an obfuscated loading of the script located at google-analytics.com/ga.js. It picks a prefix of www if it’s a standard connection and ssl if it’s an encrypted connection. The problem is that NoScript does not recognize this code and ends up in a deadlock of wether or not to allow the script to be run. My guess is that there is another script loaded from another domain called googlesyndication.com which fails to enter the NoScript-test and locks the loading of the page. After this fix Google Analytics works like a charm togheter with NoScript on any script-level setting for me. Try this at your own risc, this is still experimental to me as well! 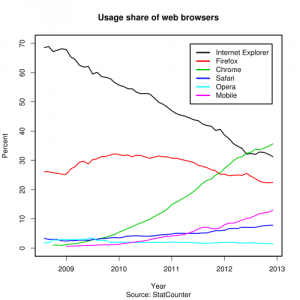 After a few weeks of Firefox 3 usage I must say I now do not miss Internet Explorer at all. With the add-ons available I’ve managed to customize my web browser exactly how I want it (only a few innovative ideas I have myself are missing). It’s proven it’s stable and fast, I’ve used it on a mixture of laptops and operating systems (Ubuntu 8.04 and several Windows versions) and everywhere it has worked as perfect as could be expected. As I earlier argued it has several advantages over Internet Explorer and I will now go in depth on one of the advantages: AddOns. Firefox AddOns are programs that extend the functionality of the web browser and I will rank the best I’ve come across so far. Everywhere I install Firefox I always install 2 particular AddOns, Adblock Plus and NoScript. These two make surfing the web safer and faster and despite NoScript requering some interaction when visiting new sites I do not find this bothers me at all. The ad-blocker works fantasticly with the EasyList subscription that contains some standard filters for ads. After the two “essential” Addons I usually pick up the IE Tab addon. With this addon you can choose to open sites or links in a tab that is powered by Internet Explorer. You can also write a filter so that some pages (like Windowsupdate.com, Microsoft.com and such) are always opened in IE Tab, this saves you from having to switch browser for sites programmed entierly for Internet Explorer. If you not only just surf the web but also use FTP the FireFTP addon is worth a look. While being far from the best FTP client I’ve seen it gets the job done and is very easy to use. Del.icio.us have been a great tool for bookmark handling and the latest installment of a Firefox addon does not dissapoint. Easy interface and installation, though a word of caution: if you run NoScipt make sure to have del.icio.us on the whitelist for scripts or the installation will fail. Those where my recommendations for now, since I’m soon on a holiday I don’t think I will have time to check out all the developer addons available but I sure will when I get back to work. Firefox did manage to pull of a world record of most downloads in one day, just above 8 million downloads the day that Firefox 3 was released. For those that participated (or perhaps would like to say that they did) a special certificate page creates a PDF you can use as a sign that you participated in setting a world record.